The philosophy of creating simple, fresh, irresistible looking food has brought Bill Granger, self-taught chef, restaurateur and food writer, success and popularity, not only in his native Australia, but also internationally. Relocating from Melbourne to Sydney in the late 1980s to study art, Bill found great inspiration in the city's lifestyle, light and its view. Whilst supplementing his studies by working part time as a waiter, his creative direction slowly changed from an art student with a passion for food to a chef with an intuitive talent for creating uncomplicated food that is as satisfying to the eye as to the palette. Breakfast - and more specifically scrambled eggs - first made Bill famous when, in 1993 five years after arriving in Sydney and still only 24, he opened bills in the Sydney suburb of Darlinghurst. In the small breakfast / lunch café he created a relaxed informal atmosphere where diners eat fuss free food around a huge communal table. A second restaurant, 'bills Surry Hills', opened in 1996 serving breakfast through to dinner. Both are beloved by locals and tourists alike and have become an integral part of the city that has so inspired Bill. Of 'bills', Jill Dupleix commented in The Times, "I would never queue for anything in my life - except a table at Bills" As the new century began Bill quickly established himself as one of Australia's leading food writers with the publication of bills sydney food (2000) in which he successfully translated the simplicity and flavour at the heart of his food and the relaxed informal atmosphere of his restaurants onto the printed page. bills sydney food has become an international bestseller, as have his three following books bills food (2002), bills open kitchen (2003) and simply bill (2005), all published by Murdoch Books. Bill lives with his wife Natalie Elliot and their three daughters, Edie, Ines and Bunny. As his family has grown, as the latter three books reflect, he has refined his approach to food by including flavours and ingredients that are popular with all ages and easy to source, but still combine to create dishes that are fresh and sophisticated. With the success of his books and the enduring popularity of his restaurants, it is no surprise that a television series should follow. In 2004 the six part series, bills food, followed Bill cooking his way through a busy working week and a casual weekend with family and friends. It was so well received in Australia that it was subsequently screened on the BBC in 2005, drawing audiences of 2 million. It has been repeated this year and shown in 22 other countries worldwide. 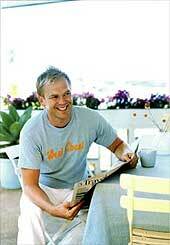 In June 2006, Bill treated GMTV viewers to a week-long cookery special filmed in the South of France. Last year, Bill opened a third restaurant, 'bills Woollahra'. Like its two sister restaurants it has attracted its own band of regulars who enjoy classic bills dishes in a courtyard setting in this leafy Sydney suburb. 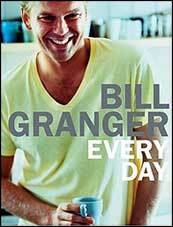 Autumn 2006 sees a new and exciting addition to Bill's portfolio when in October his fifth book, Every Day, featuring simple food inspired by Bill's day-to-day life, will be published by Murdoch Books. And keep an eye open for a second television series of bills food to be shown on the BBC.